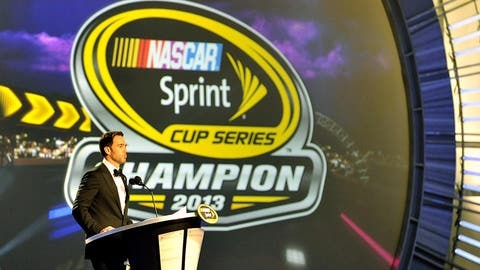 Jimmie Johnson at the podium in Las Vegas, Nevada as he accepts his sixth NASCAR championship. To Jimmie Johnson, winning another NASCAR Sprint Cup series championship was way different this time around. It wasn’t just that Johnson’s sixth title moved him within one of NASCAR legends Richard Petty and Dale Earnhardt. Instead, it could have been Johnson was grateful to make it back to the top after missing out in 2011 and ’12. Or, it might be at the ripe old age of 38 and now the father of two daughters, Johnson takes a more global view of things. But whatever the reason, after being crowned yet again Friday night at The Wynn in Las Vegas, Johnson was in a more contemplative mood than in years past. "It is soaking in far more than any other experience I’ve had, and I can’t quite identify why," Johnson said in the hotel media room after the NASCAR awards banquet. "I mentioned it out there, I think some of it’s due to being a parent now and changing along during the last three or four years due to fatherhood. That part of it blended in the joy." But there was more to it than just being a dad, according to Johnson. Whatever it is, it wasn’t a problem for Johnson this time around. "I’m letting it soak in now and at the end of the day, it’s a pretty cool experience," he said. Johnson said he got very emotional during the night’s final video montage, when his wife Chandra was on stage with him and Sara Bareilles was singing. "When they played that closing (video) clip and I was standing there with Chani, man, I had goose bumps from head to toe," said Johnson. "…That was a completely cool moment." The other highlight for Johnson was that crew chief Chad Knaus’ "date" for the evening was Johnson’s 3-year-old daughter, Genevieve, better known as Evie. "And we took her to rehearsal this morning and she did well," said Johnson. "But I assumed that when she walked out saw all the people in attendance (at the banquet), she was going to turn around and come right back in the door and it would be over. But she stuck to it and made to the chair with him and enjoyed it. It was really cool."